Well hopefully some of my old friends have followed me to my new home here at Delaware Right, and hopefully I will make lots of new friends here as well. I have titled this post “Looking Forward” because I am looking forward to working here at Delaware Right, with a group of people dedicated to creating an environment where it will be possible to have a free and open exchange of ideas. Over time I have evolved, (I know how that sounds), due in large part to my willingness to listen to others, and what they have to say, on issues facing our state and nation. I have gone from being one of the angry people, to being a person that understands that, if we are ever to move Delaware forward, it will require including all citizens of the state. That includes not only the conservatives, but the so-called moderates and yes, even the liberals. Does this mean that we must forsake our conservative values and principles? No. What it does mean, is that we as conservatives must work to discover a way to deliver that consistent conservative message, without alienating the rest of the citizens who may not hold to one hundred percent of our views. We must be willing to not only teach, but to learn as well. To not only speak, but to listen. To not only demand, but sometime to concede. Not only win, but live to fight another day. Some will see this as weakness, but these are people who have set themselves apart from the mainstream, of not only the state and nation, but from the heart of the conservative movement. They have become a fringe element that is eating away at the respectability of the ideology of conservatism. 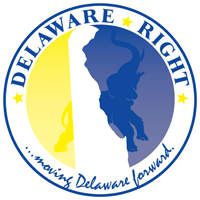 I hope, by my participation here at Delaware Right, that I add in some small way to achieving the objective of creating a place where all citizens can come to debate, discuss, and yes sometimes disagree, in a manner that allows for ideas to grow and expand into ways to move Delaware Forward! 3 Comments on "Looking Forward"
Both parties are big tent. If Conservatives want to win, they must realize that the freedom they espouse for themselves, they are unwilling extend to anyone but themselves. Not a good way to win friends and influence people…. Our deficit screams at us to raise taxes. The republican party could instantly again be a force in political arenas if instead of being against ALL taxes, they offered themselves as the party to most likely to raise them lesser than the other party…. I hope you are well Frank. I’ve “grown” too. But not in the way that you have. I have seen the direction the citizens of this state and country have chosen to go and I have no wish to contribute my time and effort in moving it “forward.” It is quite clear that we are well past the tipping point. I intend to prepare myself & my family for what is coming. I’m not wasting my energy on a society in it’s death throws & I won’t be distracted by this phony political process any longer. People will wake up when there are Soviet style food shortages, and that day is coming. Bryan, good to hear from you. I am sorry to hear that you chosen to step out of the process. While I understand your frustration, I do not understand pulling the hole in after yourself. Our first responsibillity is to our families, I agree, but as citizens we have a responsibility to our fellow citizens to be active members of this society. We can only have an effect on issues by staying involved. I hope that you see your way back into working for the betterment of the state and the nation, in my view this is the best way to work for our families and their future. good luck my friend. ← Markell’s Fisker Folly, Fraud? Or Failure?